Anymore, one has an equal amount of music streaming services to choose from as there are smart home speakers. Two of the most popular have been Apple Music for streaming, and Amazon’s Echo devices for a smart home speaker. Before you only had one option if you wanted to utilize Apple Music. The HomePod. Now the service and smart speaker are about to be united. The Echo Dot has [easyazon_link identifier="B077JFMVGP" locale="US" tag="scriptnotes00-20" localize="y"]now made its way[/easyazon_link] to your kids' room. Well, it may have already been there, but now Amazon is marketing it with colorful new bumpers and software updates. On the surface, aside from the colorful case, it would appear that there's "not much to see here." However, Amazon was able to find some items to help justify the new premium. At $80, it’s a $30 premium over the standard Dot. That price jump is largely due to the software included herein, making the device a bundle of sorts. It covers two years of FreeTime Unlimited— which includes a new premium version of the company’s smart assistant built for kids. That includes a bunch of child-friendly content, including 300 Audible books, an ad-free version of iHeartRadio Family and skills and content from the likes of Disney and National Geographic. Amazon’s also partnered with Disney and Nickelodeon on alarms, so kids can get woken up by the likes of Coco each morning. However, there aren't any new privacy features that are built into the hardware. There is still the mute button and parents can also prevent the device from answering questions. For those who are interested, the [easyazon_link identifier="B077JFMVGP" locale="US" tag="scriptnotes00-20" localize="y"]Echo Dot Kids Edition[/easyazon_link] is available for pre-order today and will start shipping on May 9. Amazon Prime Day is Coming July 11th - Are You Ready? You have probably heard by now that this year’s Amazon Prime Day will be coming up soon on July 11, 2017. 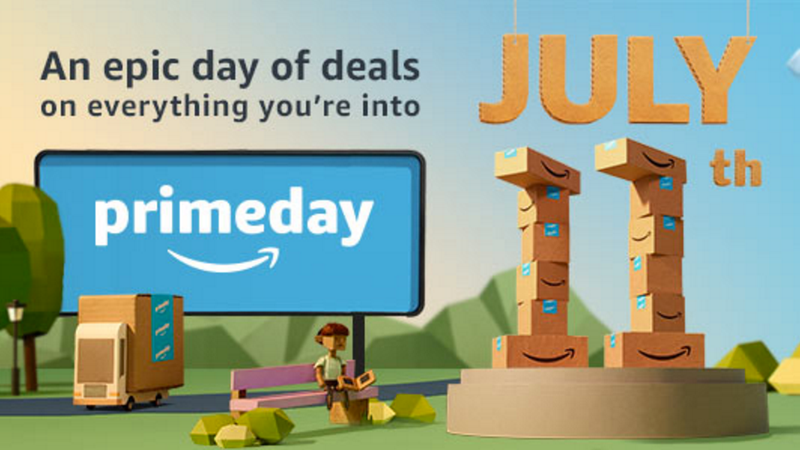 For those unfamiliar with Prime Day, it’s generally a one day only event that Amazon holds for its Prime Members to gain access to deals on items. It is generally the largest shopping day of the year for the online commerce giant, rivaling Black Friday. Read on for more details about this year’s event, in addition to a couple offers Amazon is offering to get this year’s festivities started! According to Amazon, the third annual Prime Day will be Tuesday, July 11, 2017 with hundreds of thousands of deals exclusively for Prime members around the world. New this year, members can enjoy 30 hours of shopping starting early at 6pm PT / 9pm ET on Monday, July 10, 2017 – with new deals as often as every five minutes. In an effor to highlight small businesses on Prime Day, Amazon said that nearly 40 percent of the Lightning Deals that happen during the event will be from small businesses and entrepreneurs looking to hit the ground running. In an effort to help shoppers stay organized, deals will be organized by more than 20 themes, including topics like pet lovers, gardeners, techies, artists, and more. And of course, what would be a Prime Day shopping extravaganza without Alexa?For users with Alexa devices, Amazon is introducing even more Alexa-exclusive deals discoverable through Echo devices and Fire Tablets. To get your ready and prepared for the deals you might be after, Amazon is offering a $10 credit for users who might not have signed into their app for the first time. Unfortunately if you have already, you’re out of luck. Offer expires at 11:59 p.m. (PT) July 31, 2017. Promotion code expires at 11:59 p.m. (PT) July 31, 2017. Promotion code only applies to items sold by Amazon. Another offer is that if you have yet to stream Prime Video to your TV, you can get another $10 in free credit. Terms and conditions of that deal can be found via the link. Another great deal, and one that I’m considering myself, is 40% off of Amazon’s Kindle Unlimited service, which allows readers access to thousands of books a month! Or if you prefer books of the audio variety, you can get 40% off of an Audible.com membership from now until July 11th. Prime Members can also get 4 months of Amazon Music Unlimited for 99 cents! Most of all, if you are not a Prime member yet, and want to take advantage of the above, or any forthcoming deals on Prime Day, remember Amazon offers 30 day trials to the Prime Membership service. That way you can take advantage of these deals, and then if you decide it’s not for you, you can always cancel and not miss out! Low income households can also take advantage of Prime at $5.99 a month, and if you’re a student, you can get six months free! Make sure to check it out, and certainly if you have any questions, let us know in the comments, and enjoy the savings! Amazon Prime Members - Get Dad a Last Minute Echo or Kindle Today! At Script-Notes, we like to spend time to save our readers time, and money. If you've run out of "time" for shopping for Dad for Father's Day, Amazon has some great deals going on Echo and Kindle devices! The catch though is you have to be an Amazon Prime Member for them to reach you (or him) in time for Father's Day. As we mentioned above, if you're a Prime Member, you can go ahead and order today, and you'll be in luck and get free shipping. If you're sitting on the sidelines though, and not a Prime Member yet, don't fear. You can click below for a 30 day free trial to still take advantage, and of course if you decide it's not for you, can go ahead and cancel. From personal experience though, Amazon has found numerous ways to provide value for its members. That said, let's get to the deals. As we mentioned at the outset, Amazon has a lengthy listing of deals available for its Echo and Kindle devices. We own both a regular Echo and the Kindle Paperwhite ourselves, and love both. The Echo has come in extremely handy in the kitchen for setting multiple timers, playing music, getting sports score updates and getting NPR news flash briefings. For the reader in your household, the Kindle can be great and portable and has adjustable lighting if they like to read at night. Happy Shopping, and a Happy Father's Day to all fellow fathers out there! Anymore, it probably seems like there are about as many streaming music services as there are songs available. More so, each service is trying to do what it can to differentiate itself from the other, competing for your dollars. Just like you might be loyal to a particular type of car, sometimes it can be fun to try something else. If you have been clamoring to change things up, Amazon is currently offering two free months of Amazon Music Unlimited to new users. In order to partake in this deal, you have to do so via Amazon’s promotional page. After arriving at the page, click on Enter Your Code. After the pop-up window appears, enter the code MOREMUSIC, then hit Apply. Next up, follow the link in step two on the page in order to sign up for the service with your Amazon account. Even better is that Amazon Music Unlimited offers up a free 30-day trial to all new users, but that promotional piece automatically gives you a $10 credit toward a second month’s subscription. Then once the third month kicks in, you’ll be charged $10 a month for the service, or if you are an Amazon Prime member, it will only come with an $8 price tag. What is key to remember though is that Amazon Music Unlimited is not the same as Prime Music. The latter service is a free service specifically for Prime members. The key difference is that the Unlimited service has “tens of millions” more tracks compared to the two million available within Prime Music. Even cooler is that Amazon’s music services also have Alexa integration which can allow you to play songs on an Echo device, or even find a song based on the lyrics. So if you’re interested, you may wish to hurry as the $10 credit offer only lasts until the end of the month. While we have gotten a lot of use out of our regular Amazon Echo speaker (available certified refurbished at $134.99), it's understandable that it might not be in the budget for everyone. However, if you've been looking for a chance to get into the smart speaker craze and get a start on your smart home, Amazon is currently offering the second generation Amazon Echo Dot for 24% off its "brand new" offering at $37.99. The smaller Dot, is a hands-free, voice-controlled device with a small built-in speaker - you can also hook it up to your speakers or headphones over Bluetooth or via a 3.5 mm audio cable for delivering stereo sound to whatever speakers you choose. We're three days out from Mother's Day, and if you haven't picked up anything yet, you're probably wondering how to save money on Mother's Day shopping. This is one of our favorite discounted gift card web sites to save extra money on as they frequently run promotions for additional discounts toward the weekend, and they're back again this weekend. With code: MOM, you can save an extra 6% on gift cards at Victoria's Secret, 6% at Forever 21, 6% at Lane Bryant, 6% at White House Black Market, 6% at H&M, 7% at Payless (which you may want to get a jump on due to their closing stores), and 6% at many more brands! If you have an Echo device from Amazon, as well as have a Prime Membership (another good gift idea - you don't even have to wait for shipping! ), you can save plenty on lots of great gift ideas from chocolates to bracelets, to even $30 off of a new Echo (which is great with the new Alexa calling features!) Make sure to check out our other post on how you could possibly save an additional $25 off your purchase of $50 or more if you have an American Express card! Does your Mom (or Dad) like to travel? Then you might check out IHG, which operates many familiar brands like the Holiday Inn and more. They are currently running a promotion where if you book early, you can save up to 15% off of the usual prices! We had a lot of our wedding festivities at the Holiday Inn here in Michigan and were quite pleased with the service and amenities! Other options include Priceline, which is currently running a Memorial Day sale for up to 20% off on select hotels until 5/30. Another favorite hotel chain that we like to travel to is Hilton, where you can get Mom a $50 daily credit for every night of their stay, at thousands of Hilton Hotels worldwide with code RPTVS1! Does Mom have a sweet tooth? 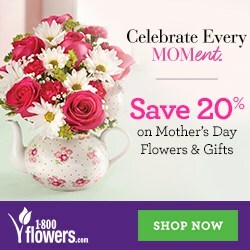 You can get 20% off Mother's Day gifts at Ghiradelli.com with promo code BESTMOM20. Or another great gift, get Mom HelloFresh and save her some time from having to go out into the throngs of the grocery store. We love the convenience with our HelloFresh meals, and how much time it saves us. Plus they measure everything out for you, leading to lack of wasting of ingredients. Right now, you can get $40 off your order with this offer! Of course you can't go wrong either with 1-800 Flowers. Make sure to check out their Deal of the Week! So there you go. Hopefully this has been able to help you with some last minute shopping ideas, and save some money at the same time! However, if there is an idea you're looking for for your own Mom, please let us know in the comments, and we'll try and do what we can to help find you a good deal! Most of all though, make sure to take this Mother's Day, and spend time with your Mom. Put down the devices, and just actually be present in the moment. That is probably more than she could EVER ask for. On the tail of yesterday's report, today brought forth Amazon's unveiling of their new Echo product, the Echo Show. Indeed, the Echo show is a smart home speaker system that gives the consumer everything in the usual Echo speaker, but now includes a 7 inch touch screen. Users will also be able to watch video flash briefings, YouTube, get a visual of music lyrics, check security cameras, swipe through your photos, get a check on the latest weather, edit your to-do and shopping lists, in addition to a host of other features. Thanks to far-field voice recognition, eight microphones, beam-forming technology, and noise cancellation, users can be heard from anywhere in the room, in addition to being heard over any loud music that might be coming from the speaker itself. In addition to a new video chat experience, that allows users to be able to make hands free calls to contacts who also have an Echo Show, or the Alexa App, there is a new feature called "Drop In." This lets users quickly contact or send messages to other Echo Show users, for quick tasks, like letting them know its time for breakfast, or check in on their little one's nursery/bedroom. Of course, what would a smart speaker be, without smart home features? The device will connect to products like Hue and Wink, as well as get visuals on your kitchen timers, and the latest news. If you are interested, the Amazon Echo Show is now available to pre-order in black and white for $229.99. It is expected to start shipping on June 28. As a special offer celebrating the device's launch, those who purchase two Echo Show devices at once can save $100 off of the order. What do you think readers? Will you be checking this out? Leave a comment below!